More than 300 news outlets are launching a campaign on Thursday to counter President Donald Trump's attacks and promote a free press. The Boston Globe made the call last week for a nationwide denouncement of the president's "dirty war" against the media, using the hashtag #EnemyOfNone. Mr Trump has derided media reports as "fake news" and attacked journalists as "enemies of the people". UN experts have said this raises the risk of violence against journalists. 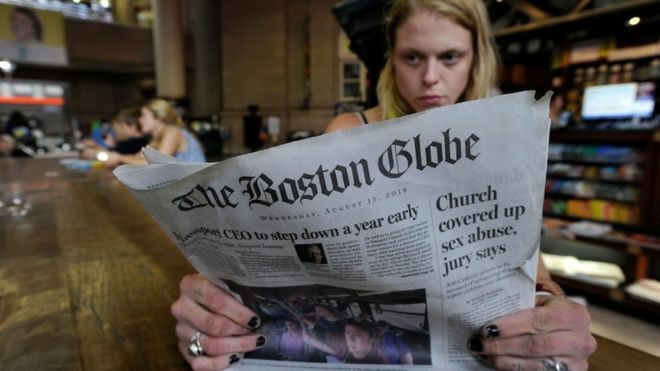 The Boston Globe had pledged to write an editorial "on the dangers of the administration's assault on the press" on 16 August, and asked others to do the same. The initial positive response from 100 news organisations has grown closer to 350 with major US national newspapers and smaller local outlets answering the call, along with international publications like the UK newspaper The Guardian. What have the papers said? The New York Post - hardly a left-leaning paper - answered the Globe's call by saying "Who are we to disagree?" adding: "It may be frustrating to argue that just because we print inconvenient truths doesn't mean that we're fake news, but being a journalist isn't a popularity contest. All we can do is to keep reporting." But it also said: "Will this make a difference? Not one whit"
The Philadelphia Inquirer said its city was the birthplace of US democracy, writing: "If the press is not free from reprisal, punishment or suspicion for unpopular views or information, neither is the country. Neither are its people"
Opinion writers at McClatchy put out an editorial for the 30 daily newspapers it runs, including the Miami Herald, saying they hardly ever spoke with one voice but were doing so now. It said "enemies of the people" was "what Nazis called Jews. It's how Joseph Stalin's critics were marked for execution"
Another paper to join the campaign was the Topeka Capital-Journal which said of Mr Trump's attack on the media: "It's sinister. It's destructive. And it must end now." The paper was one of the few to endorse Mr Trump in 2016. The fact that Mr Trump won without such media endorsements may cast doubt on whether the Globe's campaign would actually dent his support. There have been some dissenting voices to the Globe's campaign. Tom Tradup at the conservative website Townhall.com panned the Globe's "pathetic bid to pretend it is still relevant", writing: "I would not presume to tell anyone else what to think or what to do. But as for me - and I suspect many others - I won't be putting any coins in any newspaper box August 16th." The Wall Street Journal declined to take part. An earlier piece by James Freeman argued Mr Trump was entitled to free speech and the Globe's drive ran counter to the very independence it was seeking. What does the American public think? A poll released on Tuesday by Quinnipiac University suggested that 51% of Republican voters now believed the media to be "the enemy of the people rather than an important part of democracy" and 52% of the Republican supporters polled were not concerned the Mr Trump's criticism would lead to violence against journalists. Among all voters, 65% believe the news media to be an important part of democracy, the poll suggests. An Ipsos poll, also this month, gave similar figures. In addition it found that 23% of Republicans, and about one in eight Americans overall, believed Mr Trump should close down mainstream news outlets like CNN, the Washington Post and the New York Times. Have journalists been under physical attack? Mr Trump has certainly ramped up the pressure on mainstream media with numerous tweets. The Trump Twitter Archive says he has tweeted 281 times so far using the term "fake news". When he brings up the matter at his rallies, some journalists have felt uneasy about their safety and have even avoided using designated reporter zones. Are journalists increasingly under attack? At a presidential rally in Florida in July, CNN filmed Mr Trump's supporters yelling insults and swearing at reporters covering the event. CNN presenter Jim Acosta tweeted a clip, which contained strong language. A man was also arrested in January for making threats to CNN employees via telephone calls that referred to "fake news". The publisher of the New York Times, AG Sulzberger, told Mr Trump in a personal meeting in July that the president's language was "contributing to a rise in threats against journalists and will lead to violence". But most of the Globe's campaign is about maintaining a free press and its own editorial does not even touch on violence. Some outlets do, however, refer to the recent killing of five people at the offices of the Capital Gazette in Maryland. This, and an incident in which two journalists were killed live on air in Virginia in 2015, well before Mr Trump was elected, are used to highlight the dangers of the profession, although both were allegedly carried out by people with personal grievances.